From FanWraps. 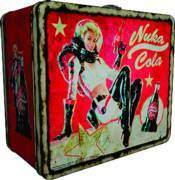 FanWraps presents the Fallout collectible tin tote featuring artwork from classic Nuka Cola ads, anti-rust coating and full color printing. Measures approximately 8' x 6-1/2' x 4'. FALLOUT LONE WANDERER DORBZ FALLOUT MYSTERIOUS STRANGER & ADAMANTIUM VYNL.